Congratulations Vicky, on a job well done. I read the cookbook thoroughly and I can’t wait to run into my kitchen and start making those delicious recipes. The pictures are so beautiful and tantalizing. I’m ready to eat the food right off the page!! The information you provide in the beginning of the book, and throughout your site, is so practical and user-friendly. Anyone, from novice chefs to amateur cooks, will roll up their sleeves and begin cooking in confidence. As a Director of the Yaldeinu school, a school for children with autism and sensory issues, I highly encourage parents to test their children for allergies, specifically gluten and dairy allergies. At Yaldeinu, we offer a plethora of different therapies, including applied behavior analysis sensory integration, speech therapy, music therapy, amongst other therapies. The most successful way I have of explaining it is that these therapies target the brain from the outside. This is absolutely crucial and necessary work. However, the most powerful way we can make real neurological change is from the inside. And the only way to access the interior of the body is through the mouth. Food enters the body through the mouth and is then digested and absorbed in the gut. If a child eats foods that cause inflammation in the gut, the entire neurological system, which of course includes the brain, will be inflamed. Testing for gluten and dairy allergies can provide parents much information about why certain behaviors occur. If a child tests positive for an allergy, there’s a serious war going on inside the body which may explain why the child displays irritability, frustration, self-stimulatory behavior and lack of concentration, amongst other behaviors. This summer Yaldeinu ran a camp for a group of special needs children. I had the privilege and satisfaction of preparing all their meals. Because we had the children 24/7, we were able to control and monitor what they ate. It was amazing to see the changes in their behavior as a result of their diet: specifically, a reduction in self-stimulatory behaviors, anxiety and tantrum. I highly encourage parents to explore the nutrition route. It’s challenging but effective. 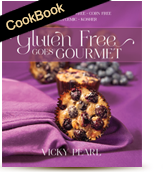 Vicky, a longtime friend and mentor, was the first one to educate me many years ago about gluten and dairy sensitivities and allergies. I personally tested positive for gluten and have been gluten-free and dairy-free for a long time. I cook this way for my family and I can tell you firsthand that it’s been beneficial for all of us. I remember that at first I was very overwhelmed and a bit lost, but I was lucky to have Vicky guide and support me through the voyage. I am so happy that Vicky now has a medium to share her fabulous knowledge and expertise with the wider public. Vicky, this is a work of art and a masterpiece. Vicky, you are an inspiration to us all. Vicky, the gluten-free and dairy-free community is lucky to have you. This is going to become my and everyone’s favorite website. Bluma Bar-Horin has been an educator for 17 years. She began her career teaching regular education students in both elementary and high school. Soon, she realized that her passion revolved around those students in jeopardy of falling through the cracks. She went on to get her masters in special education. She then founded The Yaldeinu School for children with autism and sensory issues in 2006 and has been its Director since .She is a true believer that nutrition is the key to making the biggest difference in the brain.